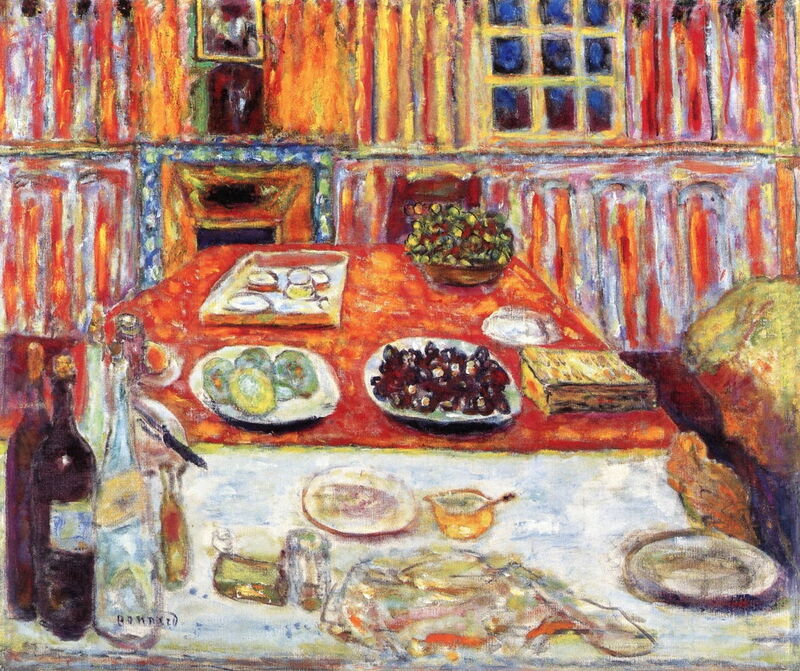 Pierre Bonnard (1867-1947), The Studio at Le Cannet, with Mimosa (1938-46), oil on canvas, 127.5 x 127.5 cm, Musée National d'Art Moderne de Paris, Paris. The Athenaeum. 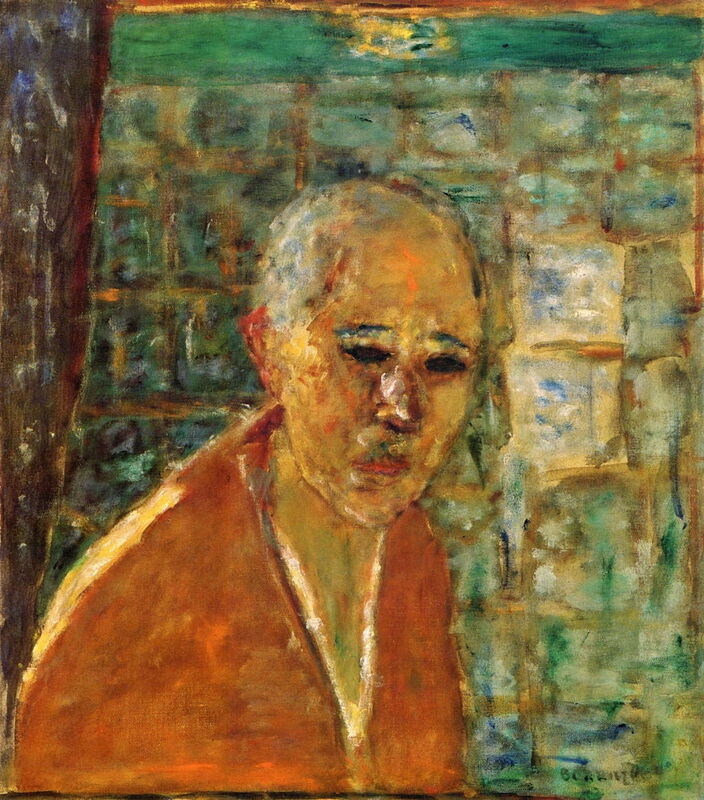 Marthe Bonnard had died on 26 January 1942, leaving Pierre living alone in their villa at Le Cannet, during some of the most difficult years of the war. In north Africa – on the other side of the Mediterranean from le Midi – fighting finished at the end of 1943, with Allied victory. Just a few months later, the Allies reached Monte Cassino in their push up the Italian Peninsula towards Rome. Then in the summer of 1944 came the huge amphibious landings on the north coast of France – close to several of Bonnard’s old haunts in Normandy. For Bonnard, 1944 was a year for appreciation of his art in print, with Formes et couleurs devoting much of its second issue to essays about his work. His friend Tériade also published a collection of fictional letters written by Bonnard evoking his childhood memories, which were illustrated by Bonnard. The photographer Henri Cartier-Bresson visited Bonnard to photograph him. At the end of the year, his graphic work was exhibited in Paris. Panoramic View of Le Cannet or The Blue Mountain was painted in gouache and watercolour between 1942-44, and shows his favourite view from his villa above Le Cannet, with the distant hills cold in contrast to the rooves in the town. Pierre Bonnard (1867-1947), Young Woman Painting (1944), oil on canvas, 61 x 49.5 cm, Private collection. The Athenaeum. Young Woman Painting (1944) might show his niece Renée Terrace, who went to stay with Bonnard in his villa in Le Cannet at the end of 1945. In July 1945, Bonnard finally returned to Paris, where he designed the special issue of the magazine Verve which was to be devoted to him. Pierre Bonnard (1867-1947), Afternoon Landscape (c 1945), oil on canvas, 95 x 125 cm, Milwaukee Art Museum, Milwaukee, WS. The Athenaeum. 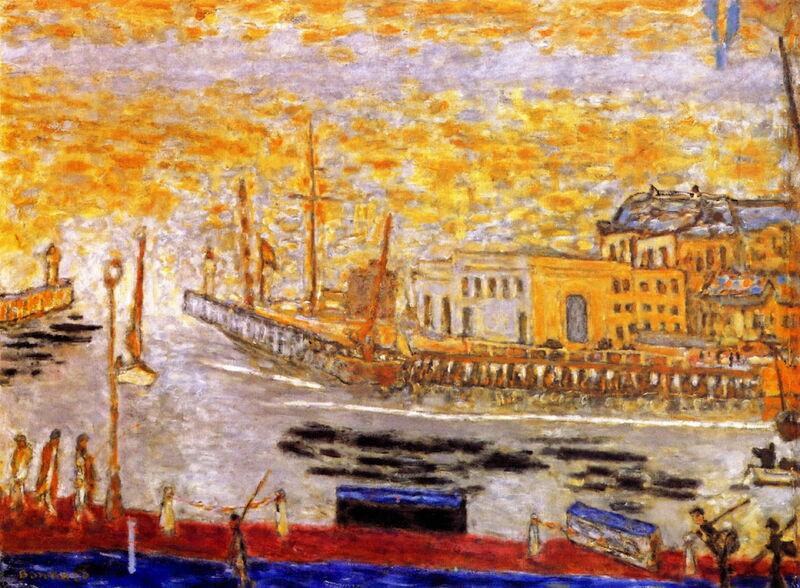 Bonnard painted this Afternoon Landscape down on the waterfront in about 1945. The sky is reminiscent of the Divisionist painting style of his friend Paul Signac. 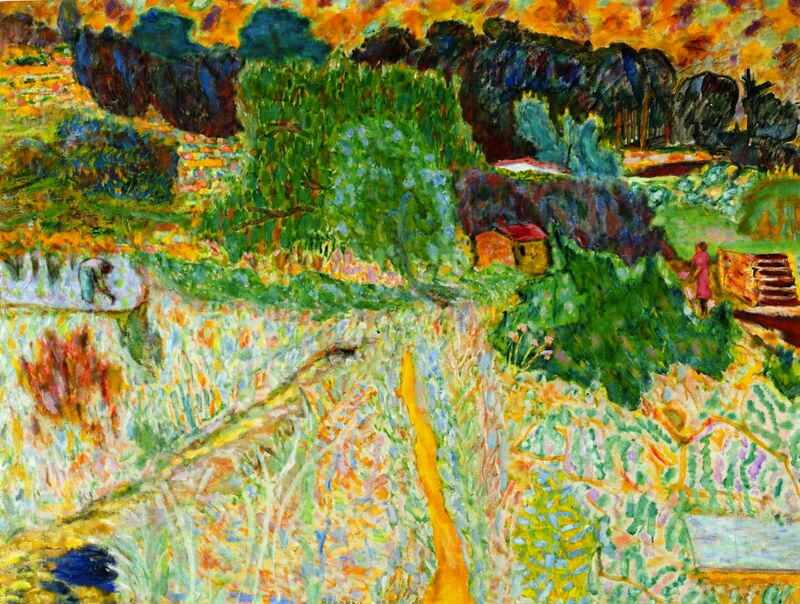 Pierre Bonnard (1867-1947), Large Landscape, South of France (Le Cannet) (1945), oil on canvas, 95 x 125.5 cm, Milwaukee Art Museum, Milwaukee, WS. The Athenaeum. Large Landscape, South of France (Le Cannet) from 1945 has been painted at the edge of the town, where its gardens give way to the surrounding countryside. Unusually, it is cropped below the skyline. Pierre Bonnard (1867-1947), Villa Bosquet, Le Cannet, Morning (c 1945), watercolour and gouache on paper, 60.3 x 50.2 cm, Private collection. The Athenaeum. 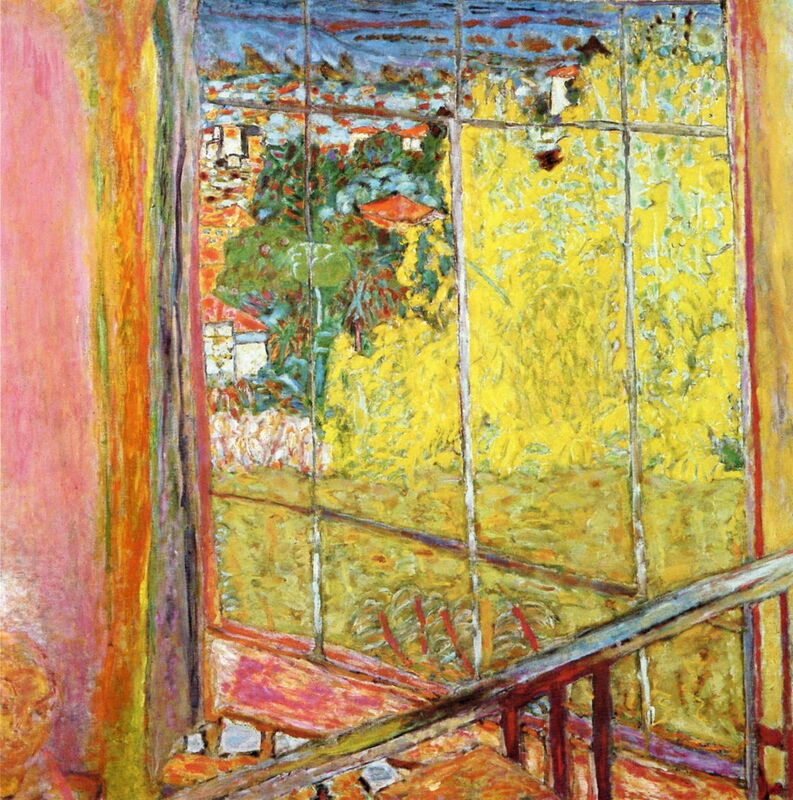 Villa Bosquet, Le Cannet, Morning from about 1945 is Bonnard’s strongest statement of his loneliness at home. The empty chair at the table and its even areas of paint are a marked contrast to his earlier domestic views. Pierre Bonnard (1867-1947), Bouquet of Mimosa (c 1945), oil on canvas, 61.9 x 67.9 cm, Private collection. The Athenaeum. 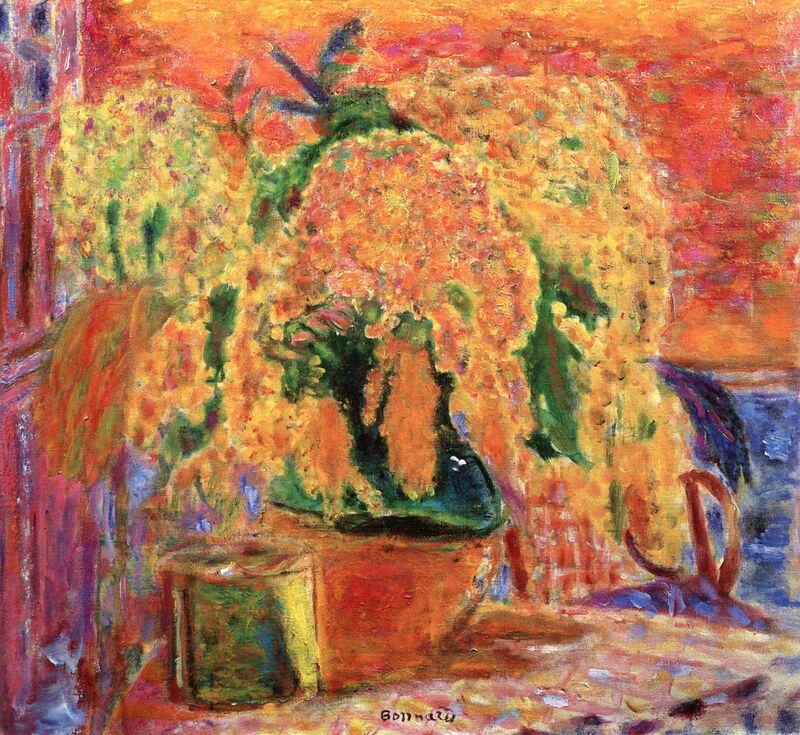 Bonnard seems to have found greatest joy of expression in the mimosa: here a mere Bouquet of Mimosa (c 1945) loses all scale and could be huge shrubs, their brilliant flowers cascading down. 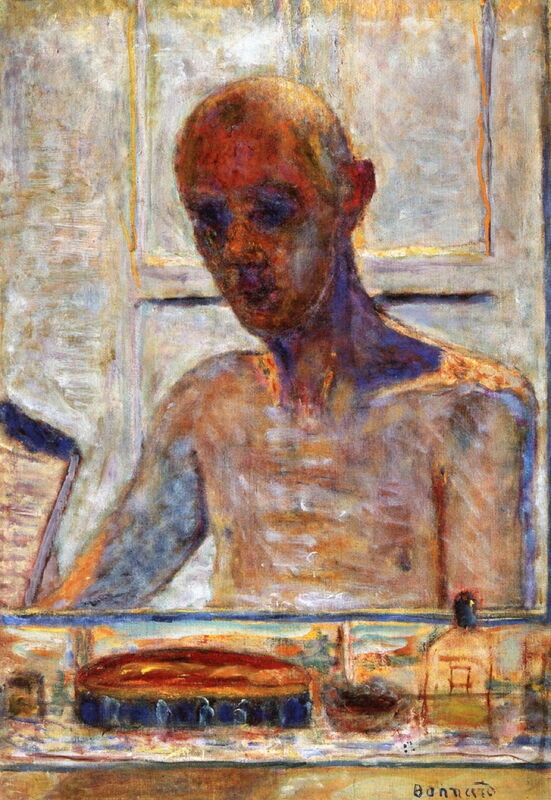 Pierre Bonnard (1867-1947), Self-Portrait (1945), mixed media, 55.9 x 45.7 cm, Private collection. The Athenaeum. His mixed-media Self-Portrait from 1945 is bleak, his skin yellow, and eyes almost black hollows. 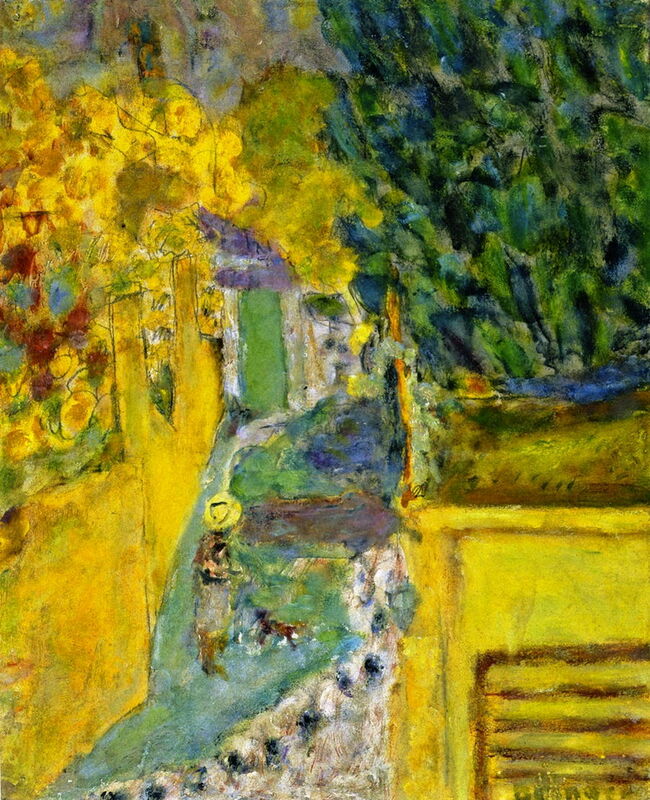 Bonnard returned to Paris in the summer of 1946, where he met André Lhote, Marc Chagall, and other artists. He then returned to Le Cannet, where in August the great photographer Brassaï photographed him in his studio. The following month, Giséle Freund took the only colour photos made of him. In the autumn, he made his final visit to the Louvre. Another self-portrait is his Portrait of the Artist in the Bathroom Mirror from between 1939-46, which shows his body looking frail too. Outside, though, the cascading yellow flowers filled the view from the window of The Studio at Le Cannet, with Mimosa (1938-46). Pierre Bonnard (1867-1947), Stairs at Le Cannet (1946), watercolour, gouache and pencil on paper, 41 x 33 cm, Musée Granet, Aix-en-Provence, France. The Athenaeum. He sees a woman walking her dog on the Stairs at Le Cannet in 1946: the mimosa seems here to sprout from the surrounding walls, frothing over their tops. 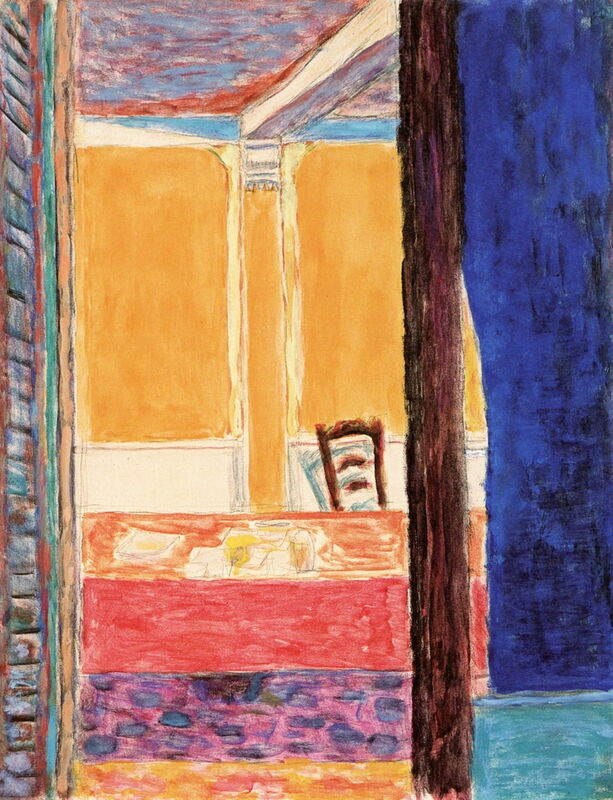 Pierre Bonnard (1867-1947), Interior: Dining Room (1942-46), oil on canvas, 84 x 100 cm, Virginia Museum of Fine Arts, Richmond, VA. The Athenaeum. Interior: Dining Room is claimed to date between 1942-46. It is dark outside. On the table inside Le Bosquet, there are bowls of fruit laid out, and at the right a blonde woman sits to eat. 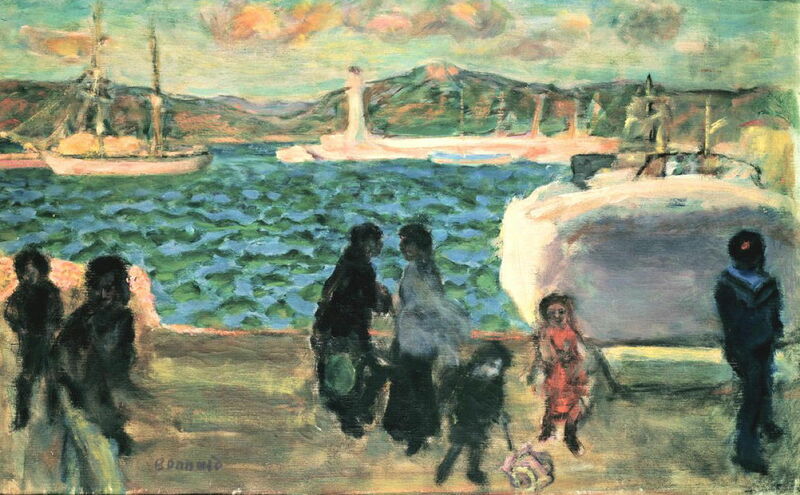 Pierre Bonnard (1867-1947), Cannes (1947), further details not known. The Athenaeum. The last dated painting I can find by Bonnard is this view of the waterfront in Cannes, which is claimed to be from 1947. It certainly appears to be winter, with cool temperatures meriting warm clothing, and a brisk wind blowing up small waves in the harbour there. 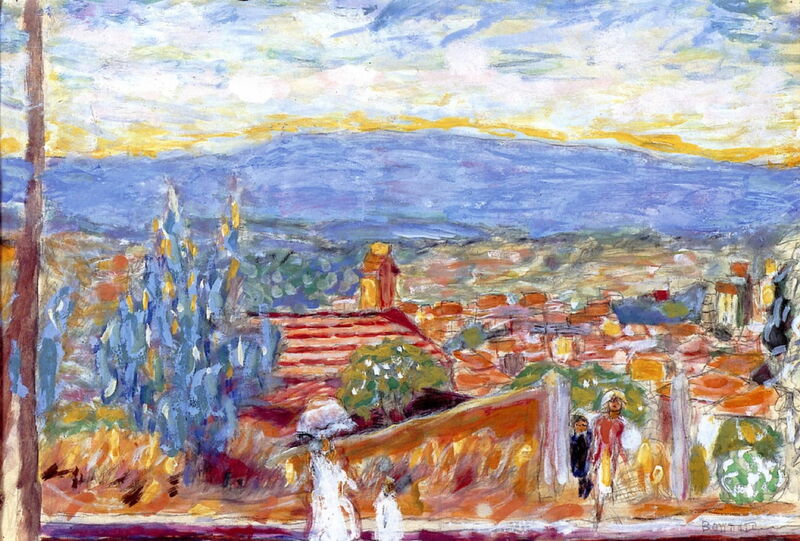 Pierre Bonnard died in Le Cannet on 23 January 1947, and was buried locally, alongside Marthe. The special issue of Verve devoted to Bonnard was published in August. 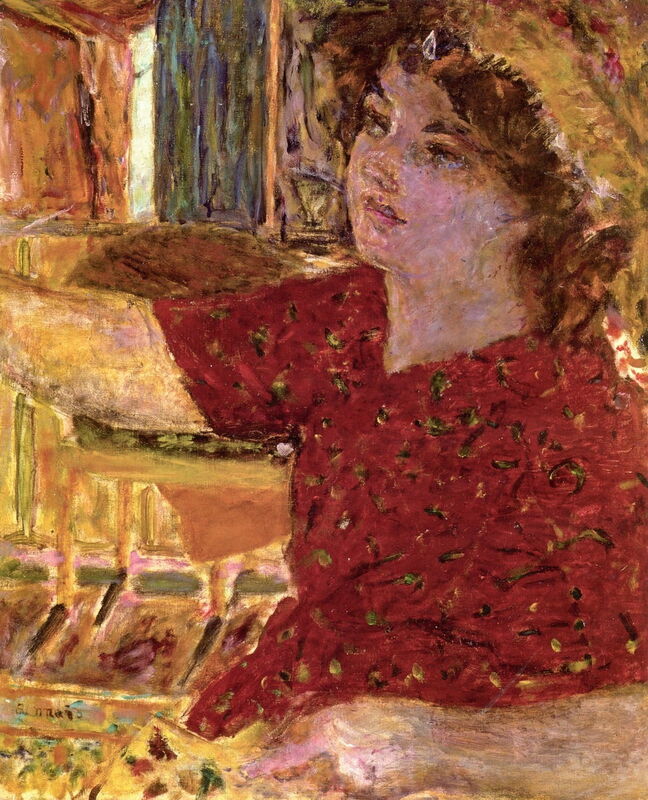 Bonnard’s former muse, patron, and close friend Misia Natanson (later Sert) died in Paris on 15 October 1950, and Henri Matisse on 3 November 1954. Posted in General, Life, Painting and tagged Bonnard, Brassaï, Cartier-Bresson, Chagall, coast, Freund, landscape, Lhote, Matisse, Nabis, painting, Picasso, Zervos. Bookmark the permalink. Hey Howard! Once again, you give us beauty, art, history — the kind of edification and appreciation of art, artists and their/our human history that our culture (at least here in the usa) is so bereft of in these days of chaos, greed and sadistic punishments toward ‘the least of these.’ Thank you. Thank you for your kind words, and for that link. In The Studio at Le Cannet, with Mimosa my mind keeps flicking from telling me there is a person bottom left to telling me there isn’t. Perhaps that’s the idea?